View More In Watch Accessories. 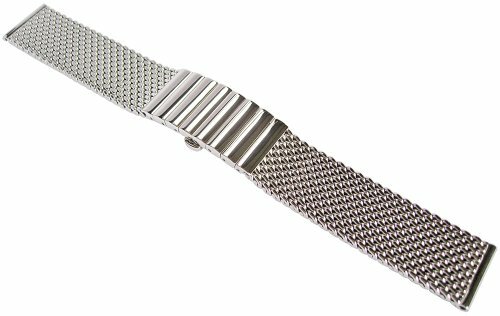 Made in Germany by Hermann Staib, a four-generation family business founded in 1922, this is one of the finest quality Milanese mesh bracelets available. Staib produces OEM metal bracelets for many of the world's most famous watchmakers. Constructed of heavy, 1.2mm-thick 316L stainless steel mesh wire, with a polished stainless steel locking butterfly quick release "pusher" folding buckle. Total thickness is 3.5mm. Fits brands including Aristo / Vollmer, Breitling, Doxa, IWC, Laco, Marathon, Omega, Rolex, Seiko, Sinn and Tutima. If you have any questions about this product by Staib, contact us by completing and submitting the form below. If you are looking for a specif part number, please include it with your message.